The Biggest Indirect tax reform of Independent India is on its way to implementation. Key steps of Constitution amendment and formation of GST Council were completed in 2015. After 12 meetings of the Council and 2 draft GST Laws (One draft in June 2016 and another Draft in November 2016), the Central Goods and Services Tax Bill 2017 (CGST Bill), Union Territory Goods and Services Tax Bill 2017 (UTGST Bill), Integrated Goods and Services Tax Bill 2017 (IGST) and Goods and Services Tax (Compensation to States) Bill, 2017 were passed by the Lok Sabha on 29.03.2017. The same will be discussed in the Rajya Sabha on 05.04.2017. The 13th Meeting of GST Council held on 31.03.2017 cleared various proposed rules under GST. The same were put up for public comments upto 10.04.2017.Hence, GST will be a reality by 01.07.2017. As we all are aware of the Central GST is on 'Inter-State Supply of Goods or Services or both'. There is also a threshold exemption limit of Rs. 20 Lakhs. For the benefit of small assesses, there is an optional levy called 'Composition Levy'. This Article discusses on the composition levy, its features, conditions and restrictions and also lists out some frequently asked questions on the composition Levy. 2. The Charging clause 9 (1) of the CGST Bill, 2017 states that there shall be levied a tax called as CGST on Intra-State supplies of Goods or Services or both at value determined under section 15 at such rates, not exceeding 20%, as may be notified by the Government on recommendations of the Council and collected in manner as may be prescribed and shall be paid by the taxable person. However, as an option to small suppliers, CGST Bill also provides for a 'Composition Levy' under clause 10 of the bill. It gives an option to a registered person whose aggregate turnover in the preceding financial year does not exceed Rs. 50 Lakhs to pay an amount calculated at such rate prescribed instead of tax payable under normal rates. This is similar to Turnover tax presently prevalent in State Value Added Tax (VAT) in many of the States. • Non-resident taxable person or casual taxable person. 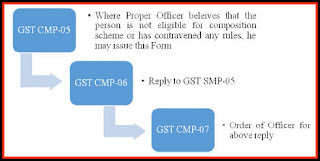 ■ Proviso to clause 10(2) of the CGST Bill, 2017 places a condition that when more than one registered persons is having the same PAN, the registered person shall not beeligible to opt for the composition scheme unless all such registered persons opt to pay tax under the scheme. Eg: A Ltd has 4 units located in Andhra Pradesh, Telangana, Madhya Pradesh and Gujarat. Each unit has to obtain separate registration in each State though all the units have same PAN. Condition is that all 4 units have to opt for composition levy or all have to pay under normal scheme. ■ Clause 10(4) of the CGST Bill, 2017 also provides that the supplier opting for Composition levy CANNOTAVAIL Input Tax Credit (ITC). ■ Supplier opting for Composition Levy SHALL issue BILL OF SUPPLY as per clause 31(3)(c) of the CGST Bill, 2017. ○ Goods held by him have not been purchased in the course of inter-State trade or received from branch outside State or imported from place outside India or from his agent or principal situated outside India. ○ Goods held in stock should NOT have been purchased from an unregistered person OR, if purchased, pay tax under reverse charge. File Form GST ITC-3 containing details of Inputs lying in stock and Capital Goods on which ITC has been availed. 2.4.3 On Non-compliance of conditions under Section or Rules, he shall start issuing Tax Invoice and pay tax under normal provisions and also shall file GST CMP-04 for withdrawl of option within 7 days. ■ Clause 39(2) of the CGST Bill, 2017, read with Rule 4 of the Draft Return Rules, 2017 provides that the Persons opting for Composition Levy have to file Returns electronically in Form GSTR-4 on Quarterly Basis by 18th of the month following the quarter. ■ Clause 29(2)(b) of the CGST Bill, 2017 provides that non-filing of return for 3 consecutive tax periods (3 Quarters) would result in Cancellation of Registration. (1) Whether the composition scheme will be optional or compulsory? (2) How to compute 'aggregate turnover' to determine eligibility for composition scheme? → The methodology to compute aggregate turnover is given in Section 2(6). Accordingly, 'aggregate turnover' means value of all outward supplies (taxable supplies + exempt supplies + exports + inter-State supplies) of a person having the same PAN. It excludes taxes levied under Central tax (CGST), State tax (SGST), Union territory tax (UTGST), integrated tax(IGST) and compensation cess. Also, the value of inward supplies on which tax is payable under reverse charge is not taken into account for calculation of 'aggregate turnover'. (3) A person availing of composition scheme during a financial year crosses the turnover of Rs. 50 Lakhs during the course of the year, i.e., he crosses the turnover of Rs. 50 Lakhs in December. Will he be allowed to pay tax under composition scheme for the remainder of the year, i.e., till 31st March? • No, the option availed shall lapse from the day on which his aggregate turnover during the financial year exceeds Rs. 50 Lakhs. (4) Should the supplier opting for Composition Levy file the intimation every year? (5) What is the penalty prescribed for a person who opts for composition scheme despite being ineligible for the said scheme? • Section 10(5) provides that if a person who has paid under composition levy is found as not being eligible for compounding then such person shall be liable to penalty for an amount equivalent to the tax payable by him under the provisions of the Act, i.e., as a normal taxable person and that this penalty shall be in addition to the tax payable by him. (6) A registered person has excess ITC of Rs 10, 000/- in his last VAT return for the period immediately preceding the appointed day. Under GST he opts for composition scheme. Can he carry forward the aforesaid excess ITC to GST? • The registered person will not be able to carry forward the excess ITC of VAT to GST if he opts for composition scheme – Section 140(1). (7) Can the customer who buys from a registered person who is under the composition scheme claim composition tax as input tax credit? • No, customer who buys goods from registered person who is under composition scheme is not eligible for composition input tax credit because a composition scheme supplier cannot issue a tax invoice. (8) Mr. A, a registered person, was paying tax under composition scheme upto 30th July, 2017. However, w.e.f 31st July, 2017, Mr. A is liable to pay tax under regular scheme. Is he eligible for ITC? • Mr. A is eligible for input tax credit on inputs held in stock and inputs contained in semi-finished or finished goods held in stock and capital goods (reduced by such percentage points as may be prescribed) as on 30th July, 2017. (9) What would happen to the input tax credit availed by a registered person who opts for composition scheme or where the goods or services or both supplied by him become wholly exempt? → The registered person has to pay an amount equal to the input tax credit in respect of stocks held on the day immediately preceding the date of exercise of option or date of exemption. In respect of capital goods, the payable amount would be calculated by reducing by a prescribed percentage point. The payment can be made by debiting electronic credit ledger, if there is sufficient balance in the credit ledger, or by debiting electronic cash ledger. If any balance remains in the credit ledger, it would lapse. (10) Is there any restriction on period for availment of ITC? → In cases of new registration, change from composition to normal scheme, from exempt to taxable supplies, the concerned person cannot avail of ITC after the expiry of one year from the date of issue of tax invoice relating to such supply.